Jenny Fraser is a Digital Native working within a fluid screen-based practice. Her work is regularly exhibited and screened Internationally and has been included in the Interactive Biennale in Mexico. Jenny uses a diverse range of creative mediums and much of her work defies categorisation. She takes iconic and everyday symbols of Australian life and places them into a context that questions the values they represent. With a laconic sense of humour she picks away at the fabric of our society, exposing contradictions, absurdities and denial. Jenny is interested in refining the art of artist/curating as an act of sovereignty and emancipation. She is a spearhead for Aboriginal Media Arts, founding cyberTribe online Gallery in 1999 and the Blackout Collective in 2002. Jenny was born in Far North Queensland and her old people originally hailed from Yugambeh Country in the Gold Coast Hinterland on the South East Queensland/Northern New South Wales border. 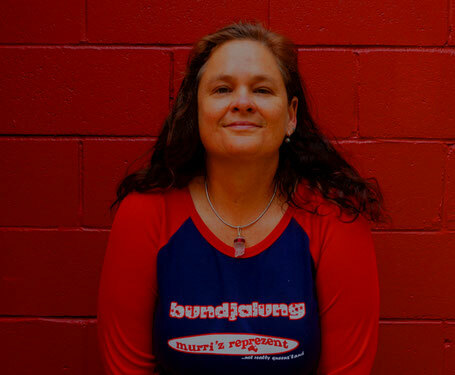 Jenny has a professional background in Art and Media Education and has since completed a Masters of Indigenous Wellbeing at Southern Cross University in Lismore, NSW, and her PhD in the Art of Healing and Decolonisation at the Batchelor Institute in Northern Territory. In 2015 Jenny was appointed as an Adjunct Research Fellow at The Cairns Institute, James Cook University, in Queensland. Her current focus is working with Bush Foods, Plant Medicine, Floral Arts and Body Work and using this raw energy to benefit healing, to help people help themselves.